Today we have R.F. Hunt here with us to discuss her newly released book, The Single Feather, a fantastic read which I highly recommend. What motivated you to begin writing creatively? When I was very young, I wrote a story and created characters called The Doo’s shaped as a letter ‘D’. My parents cut it up and stapled it together to make a book and sent it off to Hamlyn, the publishers of the Mr. Men series. Obviously, it didn’t get accepted but since then I’ve always enjoyed writing. I had planned to study for a career in Journalism, when I was involved in a serious accident. For about ten years after that, survival and being independent was my goal, and I did very little writing. It was only after my disabilities got substantially worse and I found myself at home with a lot of time on my hands, did I start writing again. How did The Single Feather come about? I had written about ¾ of a novel, when I found myself getting stuck. I didn’t care for the characters or believe in the story. I put this novel away and spent time thinking about what sort of writer I was and what I should be writing about. I’ve always been interested in stories that have a social justice element, and in my career, I worked in both welfare rights, as a manager in a social services department and latterly a Trustee with a mental health charity. So I knew it made sense for me to use some of that experience. The final motivation came from the drastic welfare cuts that have hit in particular disabled people, making life very precarious for some. I took two novel writing courses with http://www.writingclasses.co.uk and while on the first course the character of Rachel, a 31 year old, paraplegic woman became my protagonist. After that it was like filling in a giant jigsaw, without the help of a picture on the lid. Which character do you feel most strongly about, and why? I have two favourites. I like Lena, one of the older characters; she is calm, sensitive but can stick up for herself and doesn’t mind challenging some of the other members of the group. I also like Mike. Over the years I’ve known lots of ‘Mikes’ – folk who have very little in terms of resources and family support. He has a visual disability but a much more serious ‘invisible’ disability, making him vulnerable both in health terms but also in terms of being misunderstood by others. What would you like readers to come away with, after reading your novel? I’d like readers to be able to go on a journey with the characters, and although some might seem difficult initially, by the end I hope readers can understand the motivations and behaviour of each character. However, most of all, I’d like the readers to enjoy the story! What did you hope to achieve by writing your novel? I think one of the more personal issues for me was being able to write about disability without getting too upset or distressed by it. For years after my accident, I couldn’t do it. So, for me to turn what at age 18 had been traumatic and life changing, into something positive was huge. Obviously, Rachel isn’t me, our disabilities are not the same and have different causes, but at one stage even writing something fictional about disability was impossible. So, even before I thought about publication, I felt I had achieved something by setting my mind to write about disability and in the process, hopefully help others in a similar position to me. A big part of that has been something I’ve recently set up, which is a project to encourage those with disabilities to submit factual or creative writing for http://thesinglefeather.com I’m delighted that a couple of those who have submitted are now writing books!! What obstacles, if any, did you encounter when writing your novel? My biggest obstacle was pain. Sitting typing at a desk caused a lot of back pain, and once I’m in discomfort my concentration goes completely. What do you feel you gained, as a writer, through the writing of your novel? I think I’ve gained a lot of insight into who I am as writer and a person. I understand what motivates me a lot more. I also know that disability need not be the end of the conversation – that it can be the start, and it can be positive. Once your story was down on paper, did you do a lot of rewriting? Could you talk us through this process? When I finished my first draft, I had near to 120,000 words. I had it edited, and sent it off. The first lot of responses I got was that it a) needed to be shorter and that b) some of the more minor characters needed expanding. This took a lot of work. I had to read and reread and then be merciless. If something didn’t work, or didn’t read well, then it was cut. I took out a whole chapter, and then had to adjust the rest of the book so it wouldn’t be obvious a chapter had been cut. I didn’t give myself a deadline as I knew I had a lot of work to do. I resubmitted it, and the final yes came whilst I was sitting outside a lovely little bookshop in France. Once you finished writing your novel, how did you go about finding a publisher? The publishers (Pilrig Press) were the ones connected to the first two novel writing courses I did. I’ve found them very professional and give a lot of control back to the writer, rather than take it away. Do you have any future novels in the works? I have a set of linked short stories I’m working on. One of these stories features Rachel but about five years before we meet her in The Single Feather. I’m also in the planning stages of a second novel, which at present remains unnamed. 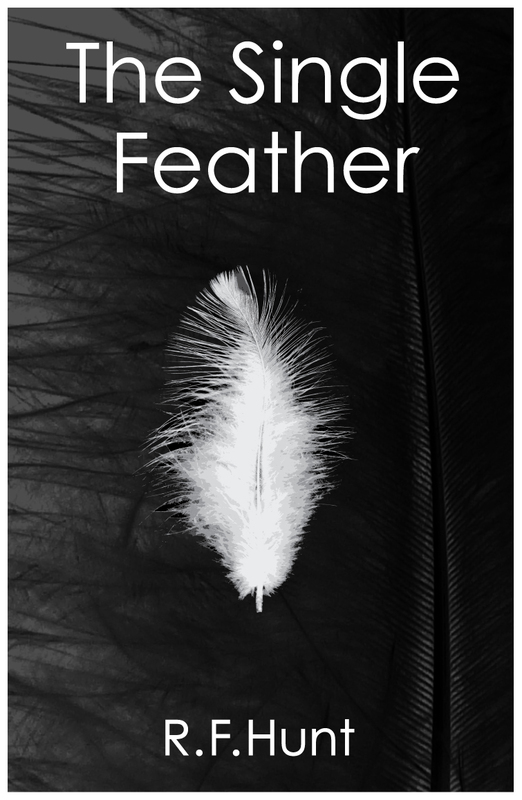 Thank you for the interview and a big congratulations on the publication of The Single Feather, available now from Pilrig Press! Signed copies are available from R.F. Hunt, via paypal. Please leave your email address in the comments box and we will arrange this for you. ← Author Interview: Katrina Hart, author of Finding Destiny, fantasy eBook just released by Pilrig Press! Marianne, Thanks for your comment and I’m glad you enjoyed the interview. 🙂 Ruth, I’m really glad you had the courage to carry on and get through the writing process. The Single Feather is a great read and the ideas resonate well beyond its pages. Thanks, Kendra – I look forward to returning the favour, and thanks again for the great questions that really made me think! A great interview, Kendra, and what honest answers, Ruth. I had no idea just how difficult it was for you to write about “disability.” I’d admire your determination. For many of us having the courage to start writing is challenging enough but you have faced much than that in the writing The Single Feather. Well done! You should be rightly proud! I always thought it would be the other way round and I I could write about disability easily. However, it was a huge block – that writing classes helped to shift! There’s so much to love here, but I found the story of R.F. Hunt’s parents sending her work to a publisher to be quite touching. It just shows how the support of our parents can be so instrumental … even if it doesn’t manifest for a decade or two. Thank you for your comments. One day, The Doo’s will return! Thank you to Kendra for this interview on her blog. Thank you so much for having me on your blog and for asking such good questions! Thank you for being on my blog! And for writing such a wonderful, thought provoking book.